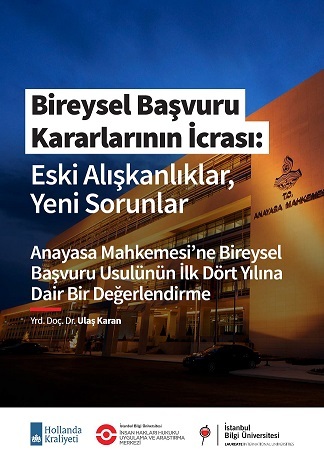 Istanbul Bilgi University Human Rights Law Research Center has published the final report of the research titled “Enhancing Individual Application Procedure by Monitoring Turkish Constitutional Court Judgments” conducted under the coordination of Asst. Prof. Ulaş Karan and with the support of Matra Programme of the Embassy of the Kingdom of the Netherlands in Turkey. Within the scope of the research, it is found out whether the judgments that the Constitutional Court rendered in its first four years of individual application procedure were executed by other judicial bodies and administrative authorities and what sort of problems were confronted in execution. As a result of the data obtained, a series of suggestions are brought forward to the Constitutional Court and other actors for developing a monitoring procedure regarding the individual application procedure. The report is the first research conducted in Turkey concerning execution of judgments regarding individual applications of the Constitutional Court. The report aims at inducing the actors that may play a role in the process of monitoring the judgments of the Constitutional Court so that the individual application procedure may contribute to improving the standards of human rights. Thus the suggestions for devoloping a monitoring procedure regarding individual application procedure that are brought forward in the report will be shared with public institutions such as the Constitutional Court, the Committee on Human Rights Inquiry of the Grand National Assembly of Turkey, the Human Rights and Equality Institution, the Ombudsman Institution and also with academic institutions and academics working in the field of protection of human rights, as well as human rights organizations. Please click to access the report (in Turkish). This report is prepared within the scope of the project titled “Enhancing Individual Application Procedure by Monitoring Turkish Constitutional Court Judgments” conducted by İstanbul Bilgi University Human Rights Law Research Center with the support of the Matra Programme of the Embassy of the Kingdom of the Netherlands in Turkey. The opinions expressed in this publication are the author’s own and do not reflect the views of İstanbul Bilgi University Human Rights Law Research Center or the Embassy of the Kingdom of the Netherlands in Turkey under any circumstances.